Up to 80% of dentists & hygienists report neck pain in a 12 month period, and if untreated, can lead to disability or early retirement. Intervention to prevent neck pain in dentistry should be evidence-based and unbiased. My doctorate studies focused on preventing neck pain among dental professionals, so I am quite passionate about this topic (and a bit of a nerd). 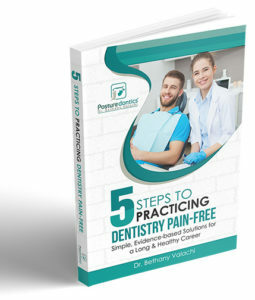 There are numerous interventions to prevent neck pain in dentistry, but here are my top 3 interventions that research shows to be most effective in the battle against neck pain in dentistry. Good declination angle Since bending the neck forward greater than 20 degrees while working is significantly associated with neck pain, loupes with an excellent declination angle are your first and foremost ergonomic safeguard against neck pain. 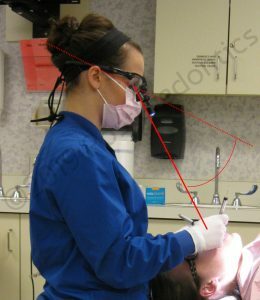 I have found that only 20% or so of loupes on the market have a steep enough declination angle to keep operators within this safe head posture. Most vertically adjustable flip-up loupes and two styles of TTL loupes on the market meet the declination criteria to keep you in a safe head posture. If you just purchased new TTL loupes, you can also easily retrofit many of them to make them more ergonomic. Learn which loupes prevent neck pain, what to ask for when ordering loupes and how to modify your TTL loupes. Check out Dr. Valachi’s video: “Dental Loupes that Prevent Neck Pain”. 2. Train your deep cervical flexors . An imbalance between the deep cervical flexors and the sternocleidomastoid/scalenes is one of the primary perpetuators of neck pain in dentistry. 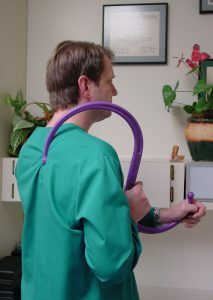 Due to repeated flexing of the neck forward to look into your patient’s mouth, the primary postural muscle of the neck (deep cervical flexors-DCF) become weaker and weaker, while the more superficial muscles (SCM & scalenes) try to substitute as postural muscles and become stronger and stronger. Neck pain results!! 3. Self-treat your trigger points. The upper trapezius muscle is the most active muscle when delivery dental care. Trigger points commonly develop in this muscle that can refer a headache behind the eye and neck pain. You can self-treat these painful trigger points yourself using a trigger point tool and ball. A treatment protocol that research shows to be most effective includes 20 minutes of moist heat, followed by a trigger point treatment protocol utilizing direct pressure and pulsing pressure, followed by 1 minute of sustained stretching. Proper clock position for the quadrant or tooth surface. 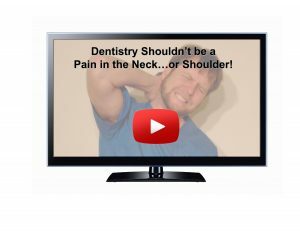 LEARN ALL THE STRATEGIES TO PREVENT NECK PAIN!